Anders # 53 was my pattern choice for my 2012 auction entry for a local charity that provides dolls to be given to children in need at Christmas. 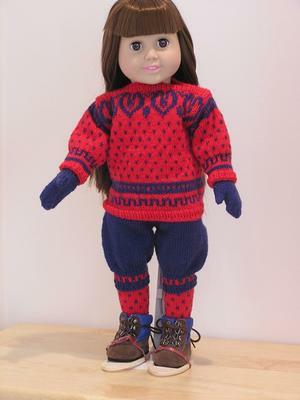 The auction provides the funds necessary to buy the dolls. Volunteers dress them. This was such a fun pattern to make! I loved how each piece came together to create a finished outfit that reminded me of clothing we wore long ago when cross country skiing. 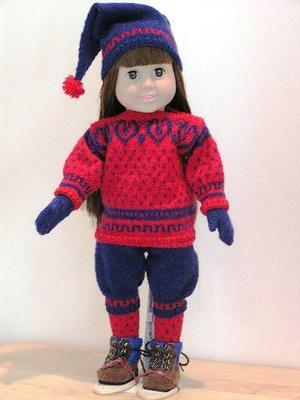 I no longer live in an area that gets enough snow for skiing, but the fond memories all came back while knitting this. 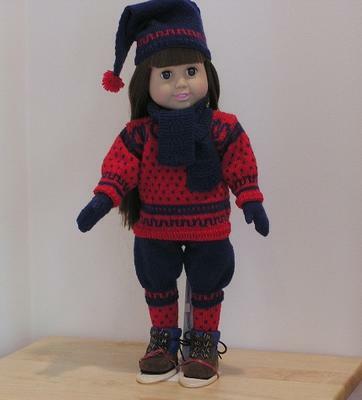 For my doll I opted for snowshoes since they were more readily available than doll sized skis. Thank you for making such spectacular patterns available and for the support you provide to those of us knitting from them. Wow, Penny, this is just awesome. The colors really pop and your knitting is perfection. Your generosity exceeds all expectations. If I made this pattern it would be hard for me to give away. One perfect outfit!